Everything is better dipped in chocolate! We had friends visiting this weekend, so we decided to use teamwork to knock out this year's teacher/neighbor/coworker gifts. My friend Amanda and I were chocolate-dipping machines! Here are the topping we used, from the top left: mini chocolate chips, almond slivers, peanuts, white chocolate with milk chocolate drizzle, coconut, chocolate with chocolate drizzle, Heath bar, white chocolate drizzle, Reese's Pieces, brown sugar, clear sprinkles and colorful sprinkles. We had more chocolate left over, so we dipped some mini-Oreos and mini-Nutter Butters and fancied them up with multicolored sprinkles. 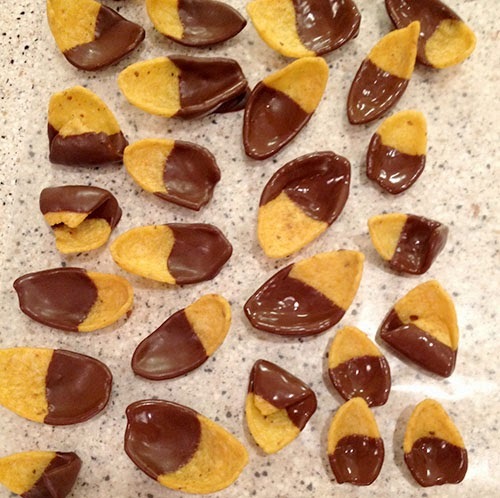 Then we had even more chocolate left over, so we found the Fritos in the pantry and dipped them in chocolate, too. The husbands were skeptical at first, but then they devoured an entire bowl so I guess they liked them. Chocolate covered Fritos for the win! 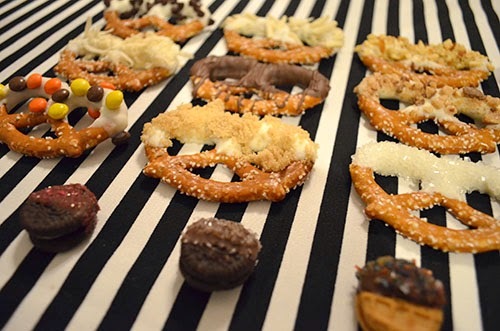 Once the chocolate dipping process was completed, we had to figure out a cute way to package the pretzels into a nice gift. I really believe putting some thought into the packaging takes an ordinary food gift and makes it memorable for the recipient. I also believe in using packaging that isn't distinctly holiday so the recipient can re-use it for something other than a holiday gift. With those requirements in mind, we went to Walmart to see what we could find. We ended up choosing these Kern wide mouth quart pickle jars ($10). 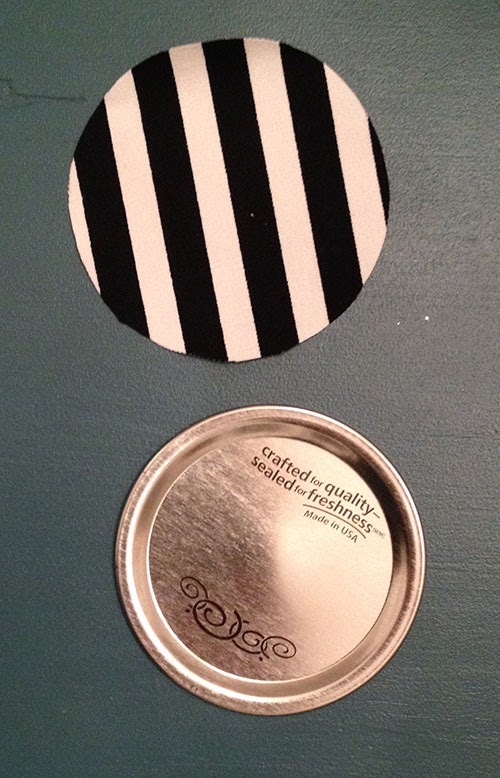 We wanted to fancy up the lids with the preppy black and white striped fabric I had left over from my holiday tablescape event, but we didn't want to do the traditional mason jar fabric lid. Going for something a little bit more modern, we put our own spin on the fabric mason jar lid. Pretty soon, we had 12 fabric-covered lids. 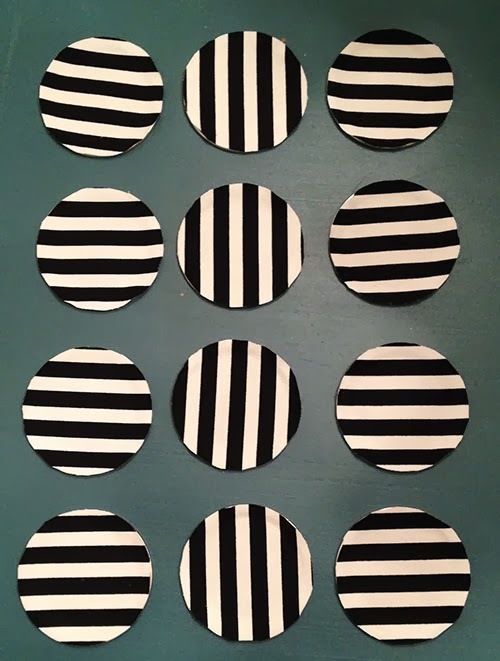 This picture makes me want black and white coasters! I also spray painted the rims of the lid with a champagne color just to make the jars a little bit more glamorous. I absolutely love how they came out! That's my kind of mason jar. 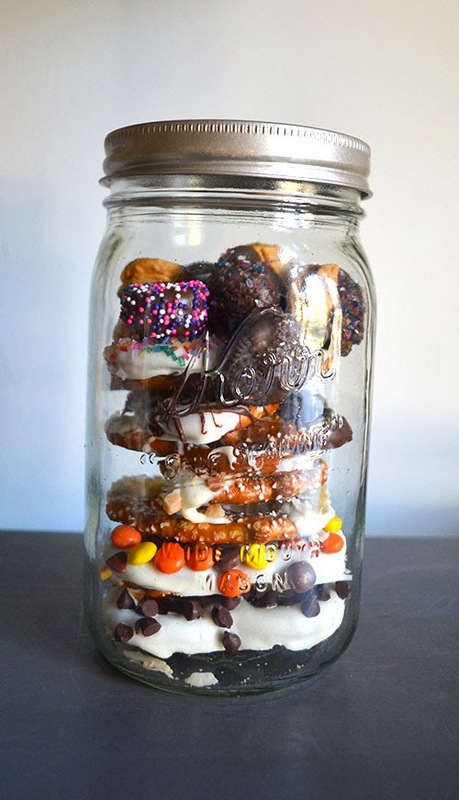 We simply stacked one of each pretzel flavor into the jars and added some chocolate-covered cookies at the top. Aren't they cute? 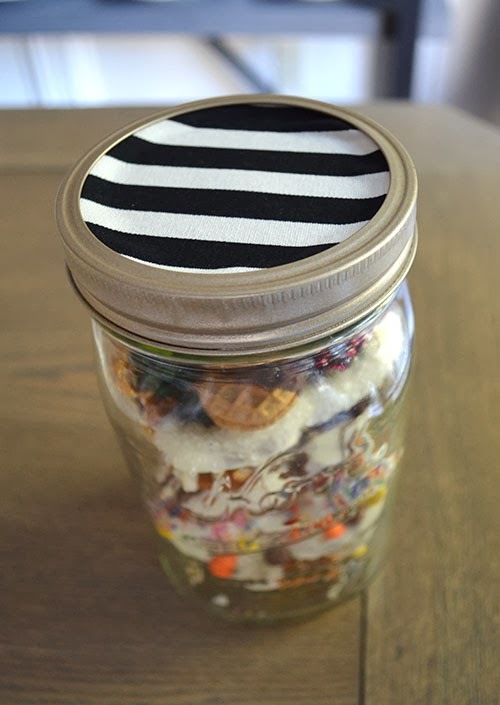 I love that the fabric makes the mason jars are more interesting than your average jar, but they still aren't too "holiday." Hopefully the recipients can re-purpose them for something! 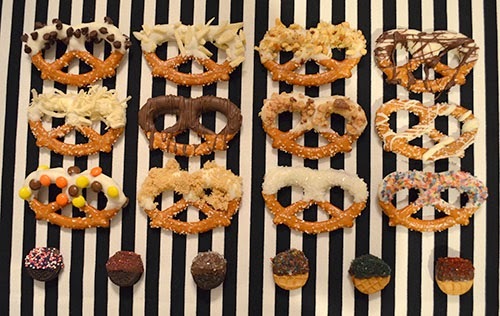 Chocolate covered pretzels are so easy and delicious. I've never met anyone who doesn't like them– have you? 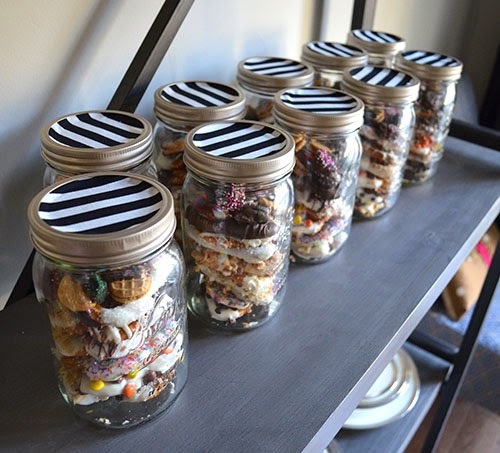 Adding interesting toppings to the chocolate makes the gift even more fun. 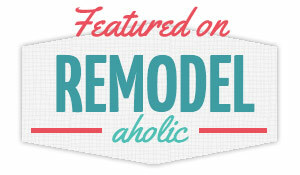 If you're searching for an easy, affordable holiday treat– this is the project for you! 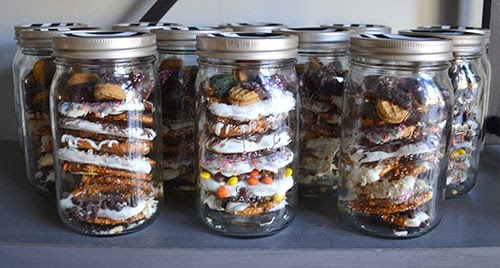 Looking for more delicious holiday gifts that are easy to make? 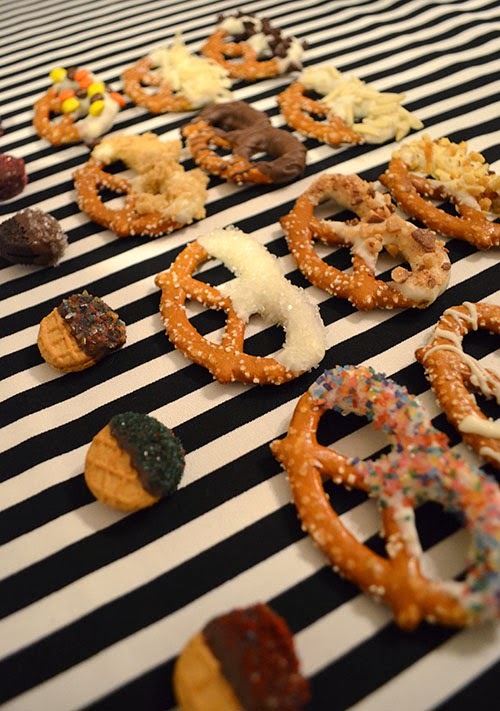 Try my Nutter Butter Santas or these simple pretzel-Rolo sandwiches!